I always look at our livestock and wonder how the US managed to get such diverse colours in their Painted Desert Sheep. 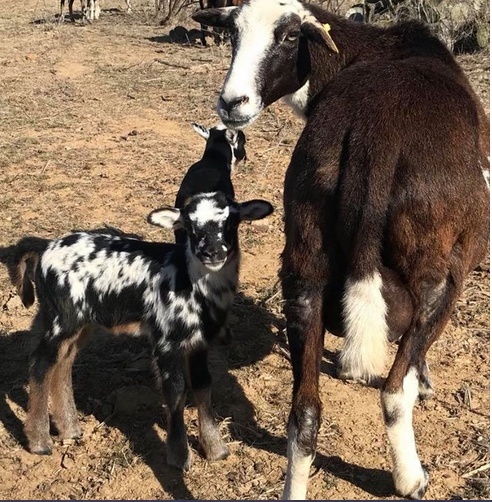 My goal for our flock is to focus on colour & horn genetics, and to select for those characteristics until we are consistently producing quality Painted Desert Sheep that are regarded with pride by our US counterparts. The US Painted Desert Registry is still pretty young, as it was only founded in 1997. The goal of the Painted Desert Sheep Society is to promote & preserve the Painted Desert Sheep through selective breeding while striving for colour, temperament, and a lean carcass. Sheep with more than 1/8 wool breeding - no longer allowed in USA; still allowed in Canada. On this page I want to focus on a few farms down south who are an inspiration to me. Their stories of how they built their herds are briefly told. Their stock is incredible, and in a few years from now, I want to be where they are. Links to these farms are provided. There are many more farms that I admire deeply. 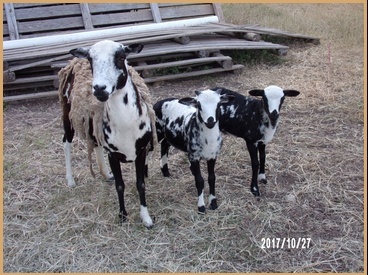 You can find them listed on the members page at the Painted Desert Sheep Society website... click the logo & link on our homepage. Arrow J ranch started with two ewes; one had a lamb at her side, the other was pregnant with twins. Their goal was to breed black & white sheep, so that dictated the selection process. They started with mantle patterning and just kept selecting what they wanted. See their website for more information ... just click on the photo to the left. Bentley Farm started before the Painted Desert breed was recognized. The only colour patterns available in the '90s were either the tri-colored barbados type with a white blanket pattern on their backs ('mantle'), or solid colored sheep with white on their faces or legs and tails. 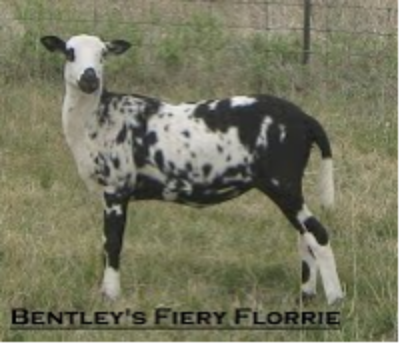 Bentley Farm worked with JJ's as the only 2 breeders looking to get black and white sheep; they shared bloodlines and still do. Their colors just kept getting better and more predictable over time. Both breeders select for the color they like, and cull the plain coloured sheep. They have culled nicely colored sheep for size or build and definitely for temperament, but mostly the pretty ones stay. They attempted to introduce some large horned stock to improve the horns, but the flighty personality was more than they could deal with. On their website, you can see the main ram is pretty plainly colored, but he is so calm and his offspring are the same. Ascott Farms bought stock that they desired; however at times found that the rams and in some cases the ewes didn't throw good colour. Over time they kept the ewes that threw pretty babies and worked up to the ram through trial and error. This ram, Nuclear Junior, was the grand daddy of our Nuclear Phin. Rusty Rail has been working on Painted Deserts for about 3 years. They started with Blackbelly Barbados and switched to Painted Deserts because of their beautiful coloring. They selected their flock slowly over those 3 years, collecting animals that had good color genetics & selling off ewes etc that weren't producing the color they wanted. They have always maintained that ewes are equally important as rams so they played around with different color combinations. Rusty Rail Ranch currently uses 4 different breeding rams. "Networking with other seasoned breeders and getting on wait lists for lambs is helpful in building a flock." Circle C's Mark Chaney is my mentor. He made the huge trip to our place in Canada to bring us our two rams from Texas. He is a wealth of knowledge, and is passionate about these animals. He helps me a lot in deciding which direction to go with our herd. One of his herd sires, "Ascott's Storming Romeo, is one of the reasons we chose Circle C Ranch. He carries the 'doberman' gene. Below are some pictures of Ascott's Storming Romeo as a baby and as he has aged. You can see how his coat has changed, morphing into something completely different .... the amazing coat of the Painted Desert Sheep.